The late afternoon stretched before me like a blank sheet of staff paper. But one little technological glitch after another kept me my progress slow; between 4 and 6 I got maybe 15 minutes of work done. So when she pinged to say which train she was on, I realized my plan to have dinner ready upon her arrival would need revising. 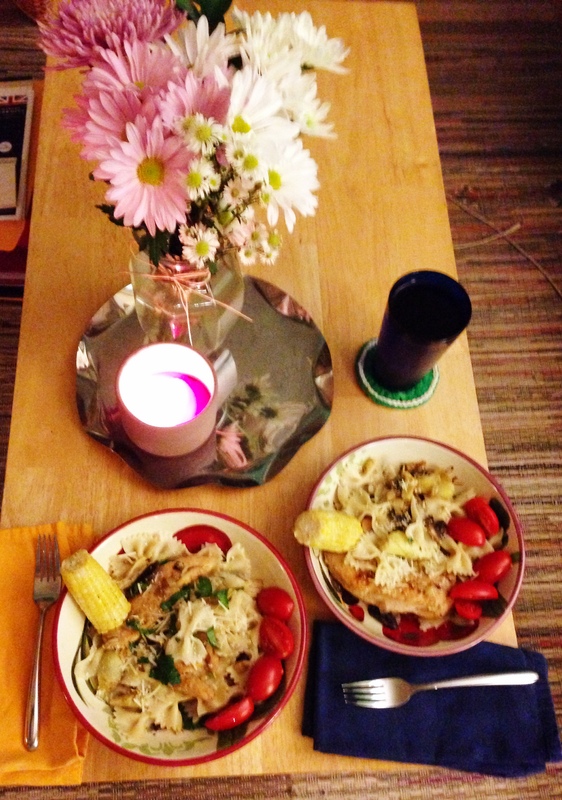 The idea was chicken with mushrooms over farfalle pasta, but there would have to be more to it than that. I diced an onion and sautéed it with some garlic to get the party started. A pot of water was salted and set to boil. I looked up to see a can of artichoke hearts on a cupboard shelf; it was easy to see, since all the cupboard doors have been removed for refinishing. I drained the artichokes, filleted the chicken, heard the water boiling, and tossed the pasta in. And saw the clock: it was time to leave to meet her train. I took the pasta pot and the sauté pan off the heat, put the chicken back in the fridge, grabbed my keys and ran. We got home, and the pasta was perfect. Who needs 10 minutes of boiling when you’ve got carryover heat to take care of business? The convergence of sautéing chicken, answering a house painter’s phone call, and assisting with first aid for a neighbor who’d fallen while running nearly derailed the whole thing, but not quite. Dinner was splendid. And, for us, served early. This entry was posted in Uncategorized and tagged Chicken, Pasta, Timing, Tuesday. Bookmark the permalink.